chocolatelikesnow: In which I am awash with pumpkins! I have been so busy in the last month I have had no time to update my blog. However, I am now (hopefully) back. This is just one of my 8, yes 8, pumpkins. I love growing pumpkins, and I very much missed my pumpkin patch when I didn't grow them last year. I love the way they trail off, rambling across the allotment. I especially love finding one that has managed to hide itself deep within the foliage on another crop (I found one such pumpkin among the sweetcorn this year). 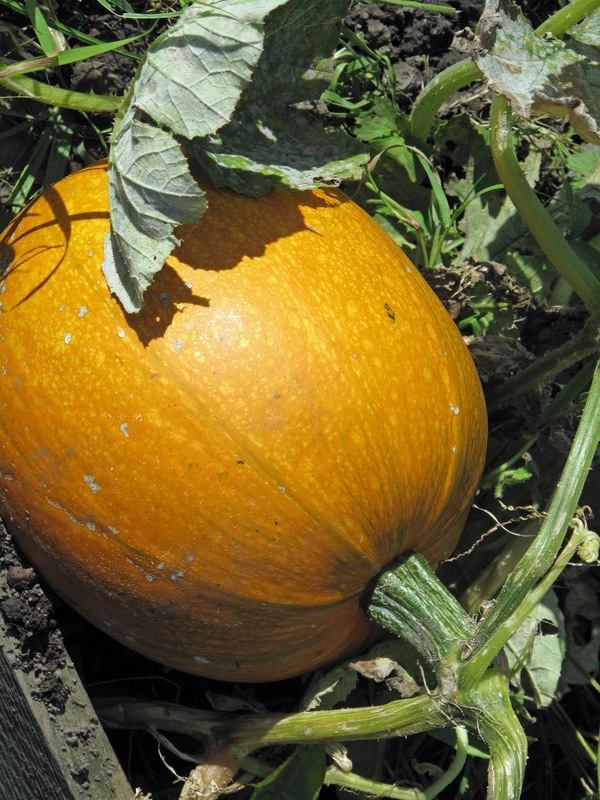 I usually grow pumpkins to eat, bar one that is sacrificed for Halloween, however after being utterly inspired by the huge pumpkin grown this year by Matron of the lovely blog Down at the Allotment, next year I may set aside one pumpkin plant to see if I can also grow a Cinderella! So, what am I going to do with my 8 pumpkins? As mentioned above, one is earmarked for Halloween, however I am not entirely sure what I will do with the rest. 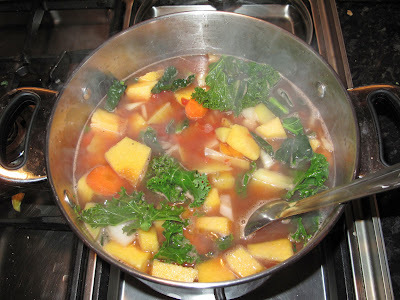 I made a head start today by chopping one of them up and adding half of it to my Autumn allotment broth, which as its name suggests, is a mixture of all the things I have from the allotment at the moment - pumpkin, carrots, onion, a chili, potato, and kale (green curly, and cavolo nero). I will roast the other half tomorrow to go with the veggie roast dinner I am hoping to make. I have found that pumpkin freezes well. In Autumn and Winter I like making root vegetable casseroles (great to make in a slow cooker) and its super easy to get a bag of diced pumpkin out of the freezer and add it to the pot. Of course, there is also pumpkin soup, which I usually make once or twice. I have never had pumpkin pie. I've just never fancied it. Maybe one day I will give it a go! If you have a surplus of pumpkins Jane Grigson's Vegetable Book has a number of recipes to keep you busy. 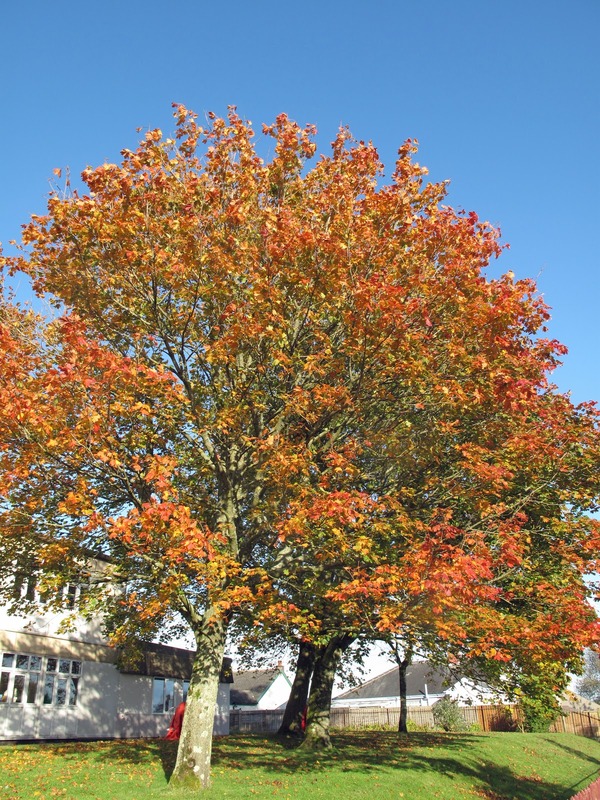 I do love Autumn. It's about the only time of year that I really appreciate orange. 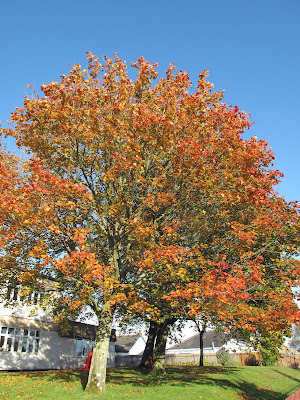 I couldn't resist taking a picture of this beautiful tree in the grounds of my elder boys' school. Maybe the super intense colours this year are due to all the rain we've had! I don't grow pumpkins but the squashes were a disaster this year - out of all the ones I grew all I got were two spaghetti squashes. Well done you for getting so many. I love soup made from squashes it is like eating velvet, yum. Yes, compared to everything else they were quite successful, although not that keen to ripen. I've tried in the past to grow other squashes with little success (this year my attempts to grow butternut squash was a total failure). My little boy wants me to try and grow Turks turban squash next year, hopefully the weather will be on my side! I love pumpkins as well. Last year we grew an amazing assortment of them. This year we've downsized a bit since we're moving at the beginning of Autumn back to Alaska but we've still managed to have quite a bit to give to family on the road. What kind of pumpkins do you grow?